Aw, hell, how did it get so dusty in here? Well, as it’s over, I might as well de-lurk. I had been following this comic for months, and I’m a little sad to see it go. But as everything must end, It is good to see it end well. Good luck to all of your future ventures. Newton’s third law of motion is “When one body exerts a force on a second body, the second body simultaneously exerts a force equal in magnitude and opposite in direction to that of the first body.” So the ducklings probably ran into something. I keep trying to think of something wonderful to say about this comic, I think one of the best things I can tell you is that it has helped me though some very difficult times, I am very sad for it to no longer will grace my new feed with joy. Wow, I made it. I’ve been binge reading the archives for a few days now and I’ve finally reached the end. This was a really enjoyable romp! I hope you feel inspired again sometime soon to dig out your camera and record some more duck shenanigans. Now, back to the archives of your son’s webcomic, which is what sent me here in the first place. Hope you and the ducks are well! Aw yay, thanks for stopping by and I’m glad you enjoyed the comic! I keep thinking some day I might dash off a few comics but I feel like it’d be a cheap move if I couldn’t commit to a longer stretch of updates. We’ll see. I sincerely hope you do! 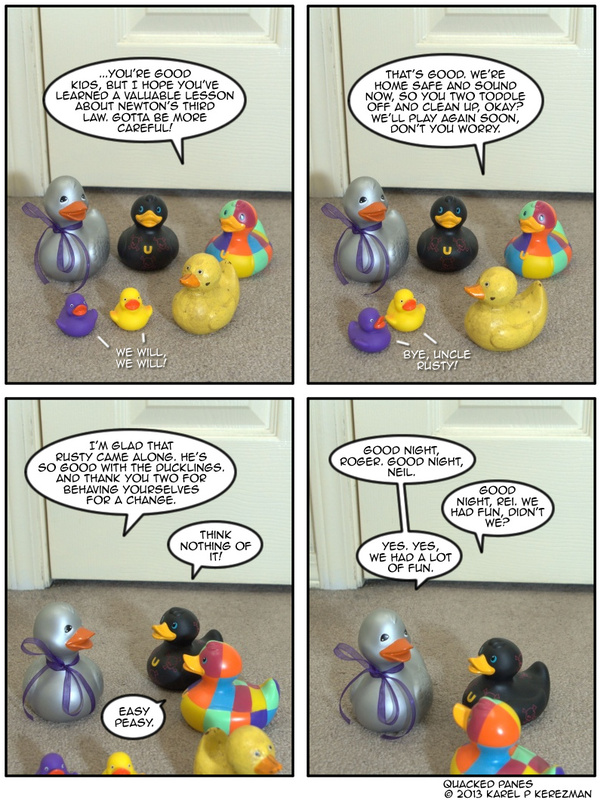 Even random and inconsistent one-offs would be better than NO DUCKS EVER AGAIN.